We may have some answers! If not, drop us a line and we will try to find the information you require. Where can I go to see Gypsy Cobs? I have asked Australian and New Zealand breeders to let me know if they are happy to have visitors come and meet their Cobs. I will add to the list when people let me know that it’s OK with them. Please call first to make an appointment as most people lead busy lives. What height is a Gypsy Cob? Originally developed to the pull the Vardos (wagons) of the Travellers, the average height of Gypsy Cobs about 20 years ago was over 14 hands. Because lifestyles have changed and not so many folk travel extensively with horse drawn wagons these days, the bigger Cobs have diminished in numbers and it’s now getting difficult to find quality big Cobs. The pony Cobs have been extremely popular in the UK. The breeders have improved them greatly, refining the head and improving the bone and joints. There seems to be a bit of a swing back to the bigger Cobs so it will be interesting to observe what will be produced over the next few years. What colours are there in the breed? Gypsy Cobs are one of the most colourful breeds of horses known and come in a huge variety of colours and markings. Some of the more unusual markings are nothing short of spectacular. So far, the only colour genes that have not been identified in Gypsy Cobs are champagne and overo (lethal if homozygous) genes. The most common colour is black and white tobiano. Blacks are also very popular followed by other broken colours and dilutes. Australia has Gypsy Cobs of most colours including the very exotic pearl gene as well as the spectacular silver dapples, palominos, buckskins and now also the very rare blue roan. Coming soon will be a page showcasing all the different coloured Gypsy Cobs currently in Australia. How much does a Gypsy Cob cost to buy? Where's the best place to find Gypsy Cobs for sale? What are the best breeds to cross with a Gypsy Cob? The choice of what to breed to a Gypsy Cob should be determined by the end use. If you want to add speed or breed a competitive sport horse then Thoroughbreds, Arabians, Warmbloods and their derivatives work very well. If you want to breed reliable children’s ponies then choose a pony mare with good temperament. Standardbred horses crossed with Cobs produce a lovely honest type of horse that is good for driving, jumping, ARC or trail. It should go without saying that the choice of both breeds should be healthy, well-conformed, good tempered individuals. Because Gypsy Cobs are very popular at the moment, there are unfortunately, con-artists advertising coloured cross bred horses as Gypsy Cobs often with no Gypsy blood whatsoever. There are also a number of unscrupulous breeders using part bred Gypsy Stallions to cover any mare they can get their hands on no matter how poorly conformed or bad tempered. Please do your homework before buying a surprisingly cheap Gypsy Cob. Are Gypsy Cobs difficult to look after? Gypsy Cobs require quite a bit of grooming if you want them to look immaculate all the time. You will need to ensure that if they have feather mites that they are treated correctly to eradicate the mites. What can Gypsy Cobs be used for? Gypsy Cobs are an extremely versatile breed of horse that will happily have a go at most things. Gypsy Cobs were developed to be driving horses, it’s a use that they absolutely shine at. Steadfast and generally unflappable they make for powerful driving horses. With a little training they are safe to drive past all sorts of things that may upset hotter breeds. 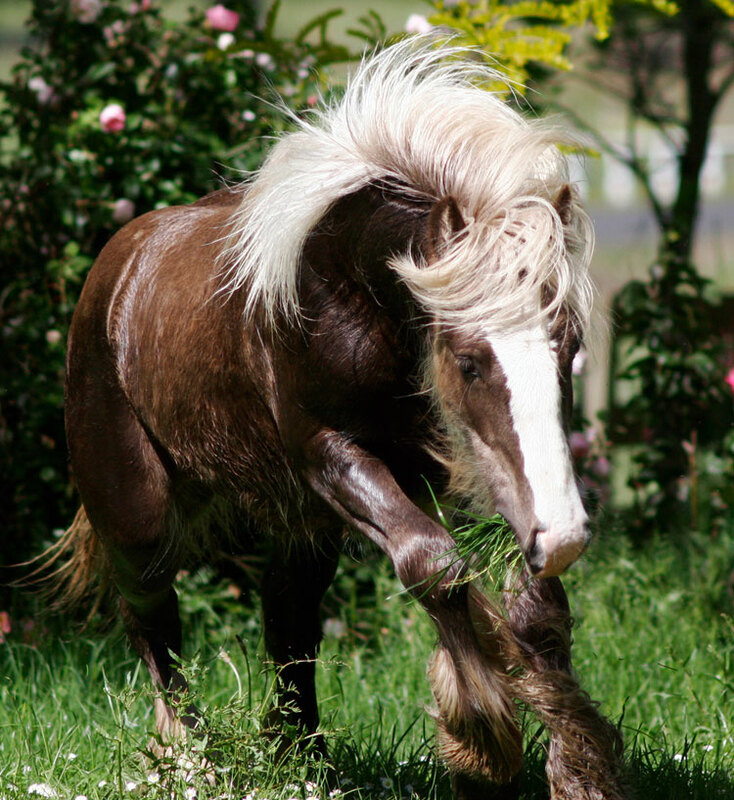 Are Gypsy Cobs Coloured Draft Horses? Other breeds used in the development of what we know today as the Gypsy Cob included the Dales and Fell ponies as well as other horses native to the UK. The Gypsy Cob has characteristics of both heavy horses and the hardy native pony breeds from which it is derived. Gypsy Cobs may be best described as powerful carriage horses. They were developed to pull the living wagons of the Romany people whereas Draft horses were bred to work on the farm and therefore the ideal conformation differs for both types in accordance with the work required of them. One of the most common mistakes made by heavy horse judges who have not “lived and breathed” the Cobs is to judge them the same way they would say a Shire or Clydesdale. We don’t as yet have any judges in Australia who have had enough training to know the subtle differences, however, I believe a few (much to their credit) are studying the breed. Light horse judges may be inclined to go for leggier and longer riding type horses that do not quite exhibit enough breed type. Where did Gypsy Cobs originate? Traditional Irish Cobs (Gypsy Cobs as they are mostly known now) were developed by the Irish Farmers, Travellers and Traders. The commonly held fairy tale that the breed was developed by the Gypsy people of the UK is a romantic spin on the truth. Proper Cobs were purchased by the lorry load from both fairs and the breeders themselves during the hey day of their burgeoning popularity. Horses were often renamed and their origins not acknowledged. Many of the greatest sires in the breed were bred and born in Ireland or are the direct descendants of Irish horses. Some of the greats can be found here. During both World Wars many of the plain coloured horses in Ireland and the UK were taken by the Military leaving behind broken coloured horses which were then freely available. Considered undesirable by the conservative equine community, coloured horses were not highly valued. It was not until the mid 20th Century that the horse we know now as the Gypsy Cob started to evolve. Feather and bone were improved and as the wealth of the breeders increased, so did the quality of their horses. Cobs have been used as bank – an investment that could be cashed in as needs arose. What is the difference between a Gypsy Cob and a Gypsy Vanner? That’s the sort of politically dangerous question that could start another World War! The Travellers had no specific name for their breed but rather mainly referred to quality stock as Proper Cobs, Coloured Cobs or just Cobs as well as a few slang terms and still do although the “Gypsy Cob” is preferred in England and Irish Cob in Ireland! How the term Gypsy Vanner came to be: Dennis Thompson and his late wife Cindy from the USA were taken with the Cobs on a visit to England and imported the impressive stallion Cushti Bok to the USA. The horse naturally created a sensation and a great deal of interest in the breed. Dennis coined the term Gypsy Vanner to describe the breed and patented the name in the USA. Much of the world wide interest in Gypsy Cobs can be credited to the promotion of the breed by the Thompsons and also Jeff Bartko and his late wife Christine of Black Forest Stud. Between them they imported hundreds of Cobs to the States and introduced thousand of people to Gypsy Cobs / Vanners. Personally, I am grateful to both of them as I doubt I would have Cobs in my life without their efforts. The breed is also known as Tinkers and Irish Cobs in Europe but they are all one and the same. What's involved with importing a Gypsy Cob from the UK? Finding a top quality Cob in Ireland or the UK to purchase can be an absolute minefield. Although most imports work out well, there are some that have been a great disappointment for the purchasers. My advice if you are going to invest such a serious amount of money overseas, is to do your homework very well. Take your time, study the horses on Proper Cobs Facebook Page and search for terms like “good legs” etc to learn, study the photos that have many likes. Those are the quality Cobs. Look past the colour and hair. It’s all to easy to be distracted by the Wow Factor and fail to see the conformation underneath. Do not rely on anyone’s word that they will supply DNA proof of breeding if the horse is not already typed. If it’s important to you (and it should be) do not pay the full price for the horse until such time as a lab has verified the breeding told to you as correct. We learnt that lesson the hard way, with DNA of ancestors and detailed breeding history being promised but never eventuating. Importing a mare in foal to a famous stallion can be problematic too. There have been a few cases here where the resultant foal has failed DNA verification to the supposed sire. Unfortunately, there’s no way of authenticating that without endangering the mare and unborn foal. If you are importing a stallion have a fertility check done and ask to see photos of any progeny sired by the horse. Organise an independent vet to check the horse and pull the hair for typing. (Horses have been imported to Australia supposedly DNA typed that have proven to be incorrect) Ask the vet to verify the age as it’s fairly common for dealers to greatly underestimate a horse’s age. If at all possible, travel to the UK or Ireland and visit as many breeders as you can. You will need to get your eye in and it takes time to do so. The cost of going to see your prospective purchase is small in relation to what it will cost you to get a Cob here. It could save you a great deal of anguish if the horse is not what you expected. Speak to people here who have imported horses and ask them about their experiences. Google the seller’s name and you may well uncover who has been great to deal with and who has not been. We have found that purchasing a Cob straight from their breeder has been a good choice. Some dealers who trade hundreds of horses add their own stud prefix to Cobs they purchase from sales and fairs. In many cases they have no idea how the horse is bred or if they do, will not pass on the details to the purchaser. What is their temperament and personality like? It’s very difficult to express in words just how different these horses are to most other breeds. In some ways they are similar to dogs in that they grow very attached to their human family. Gypsy Cobs will happily follow wherever you go. You really have to live with the to truly get their unique characteristics. Gypsy Cobs are inquisitive, extremely intelligent horses. People can often mistake their laid back personalities for lack of “the smarts” but nothing could be further from the truth. You only have to work with them for a little while to realise just how fast they can learn new things. They have great retention and do not require new habits or trainings to be endlessly repeated. We have found that overly repetitive training will more than likely switch them off mentally. The Cobs like to participate in whatever activities their people are doing and like to be as close as possible. Can’t find what you are looking for? Submit your question.